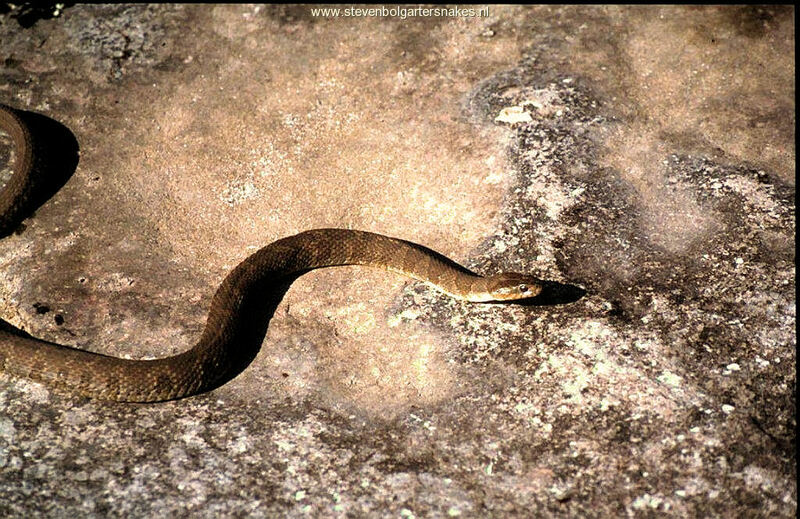 The Northern Watersnake (Nerodia sipedon) is closely related to the most famous Nerodia species from North America: the Banded Watersnake (Nerodia fasciata). 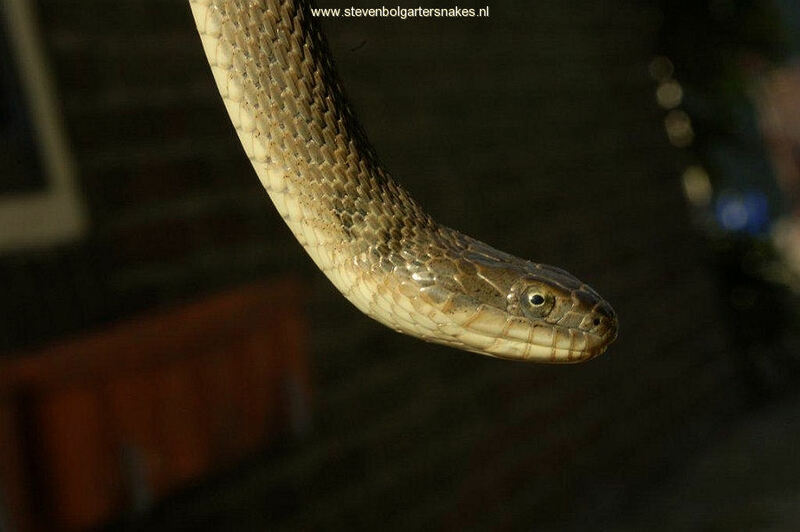 Unlike the Banded Watersnake the Northern Watersnake is much less encountered amongst European Snake collections. Part of it will have to do with its rarity amongst imports from the USA and Canada. N.fasciata has been and still is regularly imported (especially N.f. pictiventris from Florida) and found in Reptile Shops, whereas N. sipedon only rarely makes it to Europe. In the past the Northern Watersnake and the Banded Watersnake were considered to belong to the same species until biologists discovered that the two species overlap their ranges in certain areas without interbreeding, although there are locations were interbreeding occurs (Gibbons & Dorcas, 2004). Specimens from those locations will be very difficult to identify, especially if you do not know their exact origin. The subspecies Nerodia sipedon insularum is a unique subspecies of N.sipedon that has a very limited distribution within Lake Erie and typically lacks all dorsal pattern (bands and spots). This subspecies is highly aquatic. The snakes show strong sexual dimorphism with females growing much larger (150 cm total length) then the males ( approximately 120 cm total length) and they also become much heavier built. 150 cm is a record size, normally large females do not exceed 110-130 cm. Especially the pregnant females can become quit impressive. But compared to other members of the Nerodia genus (like N.rhombifer and N.taxispilota) N.s.insularum is more slender built. In literature ( in: Seymour & King, 2003) it is stated that N.s.insularum has larger adult body size, lower growth rates and shorter tails compared to the Northern water Snake (N.s.sipedon). 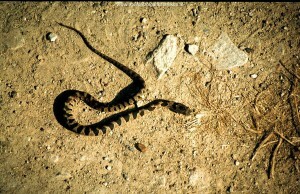 N.s.insularum male of 70 cm with (vague) crossbands on may 7th 2005. N.s.insularum is a pale race of N.sipedon that usually lacks the dorsal crossbands and blotches and which is uniform greyish, brown-greyish or even green-greyish.. 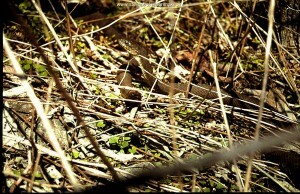 This is quit a unique colour pattern amongst North American Watersnakes. Although my adult couple is practically unpatterned a portion of the young still show vague traces of dorsal cross bands. In many snakes the bottom traces of the bands and blotches are clearly present and well marked just above the ventral scales. But this is mainly visible when the snakes are inspected from underneath, from above they appear to be unpatterned. The belly may be pale, close to white without the typical markings of N.s.sipedon. Some specimens have a beautiful orange line on the belly or some greyish mottling. 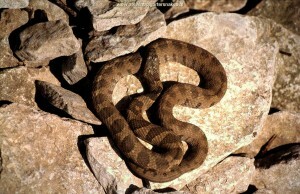 Some specimens still have the banded pattern with often very vivid coloration. Nerodia fasciata has been imported frequently over the years and they can easily be mistaken with N.sipedon.Both species typically have attractive cross bands all over their body and they look quit similar in general appearance. Both species can be highly variable; they occur over a large area in North-America and there is a big variation in coloration and pattern. The most conspicuous difference is that N.sipedon lacks the black stripe from the eye down to the corner of the jaw and the fact that the crossbands are only true bands on the anterior portion of the body. On the posterior portion of the body the crossbands change in alternating rows of blotches. More details can be found in the excellent book of Gibbons & Dorcas (2004). 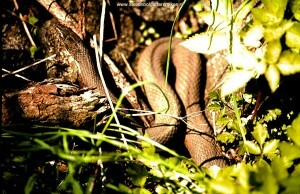 Lake Erie Watersnakes do well in a warm terrarium with a perfectly dry land area with high day temperatures. Due to their large size minimum size of the terrarium should be 100x50x50cm, but 150x50x50cm is better. Night temperatures in spring and fall may drop considerably, this is no problem. They do not need a lot water to do well in captivity, although I expect that they will show more activity when they have access to a large water bowl They will probably spent more time swimming and (especially in case they are fed with live fish) hunting underwater. They like to spent the night submerged in the water bowl. The adults snakes are almost always well visible and sunning in the terrarium. The juveniles tend to be more secretive and like to hide underneath rocks etc. The juveniles do very well when the terrarium also is heated from underneath, but this increases its secretive behaviour since they can easily reach their preferred body temperatures while hiding. 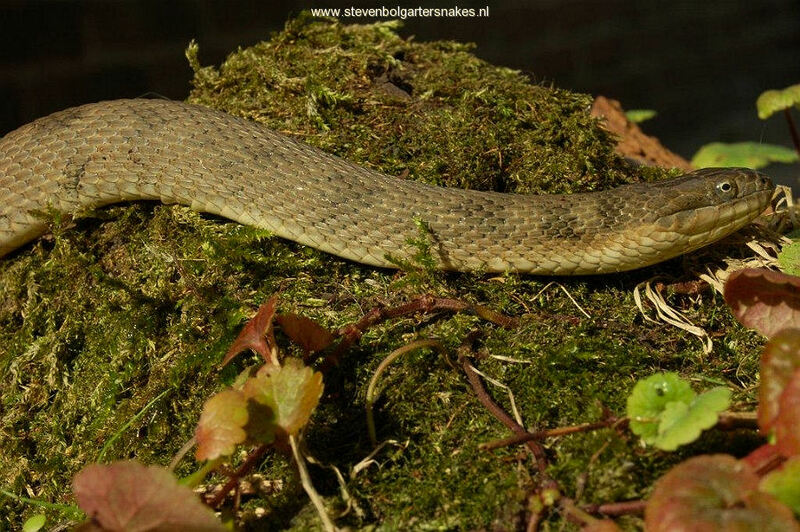 Since the Lake Erie Watersnake comes from an area with cold winters I expect they should be very suitable for an outdoor terrarium, although the Dutch summers (and especially spring and fall) may be a bit too wet, cool and without sunlight for them. Since May 2009 I keep a group of snakes in my outdoor terrarium and indeed this have been going well. 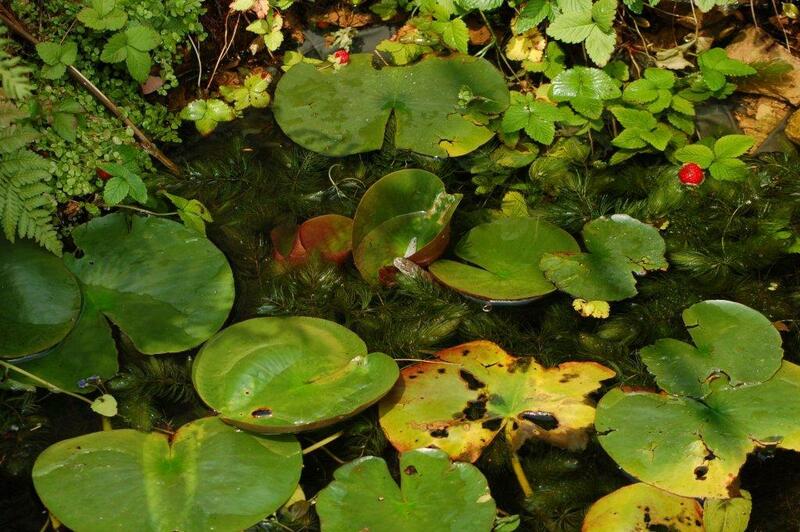 I intend to update observation on N.s.insularum in my outdoor terrarium on this website. Behaviour in the summer of 2009 in the outdoor terrarium with a small pond was very different from the behaviour I normally see indoors. Even though the snakes are fed with dead fish offered on a small plastic dish on the land part they react by hunting in the water. Then they crawl out of the pond , grab a fish and go back to the pond to eat it. If the snakes are disturbed they dive to the bottom of the pond. In contrast to T.radix and T.s.pickeringii inhabiting my outdoor terrarium which tend to escape over land hiding in bushes etc. After a while the N.s.insularum come to the surface with only their heads protruding above the water checking whether the danger has gone. They can stay in that position for a while. Very similar to the behaviour of the highly aquatic Natrix maura in Southern France for instance. Nerodia sipedon occurs from South-Eastern Canada to northern Florida on the eastern part of the USA. It reaches its most western distribution in Colorado. 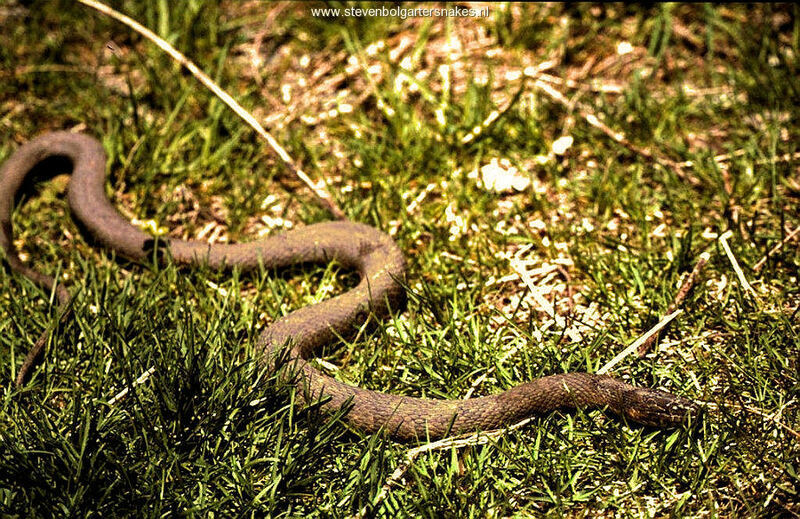 There are four subspecies described for the Northern Watersnake: Nerodia sipedon sipedon, N.s.pleuralis, N.s.williamengelsi and N.s.insularum. 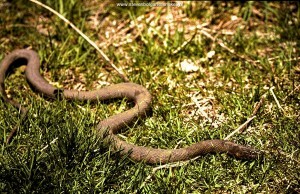 The most rare ones are the Carolina Watersnake (N.s.williamengelsi) and the Lake Erie Watersnake (N.s.insularum). N.s.insularum was described in 1937 by Conant and Clay and they named this subspecies “insularum” to the fact its distribution is restricted to a few islands in the western part of Lake Erie. 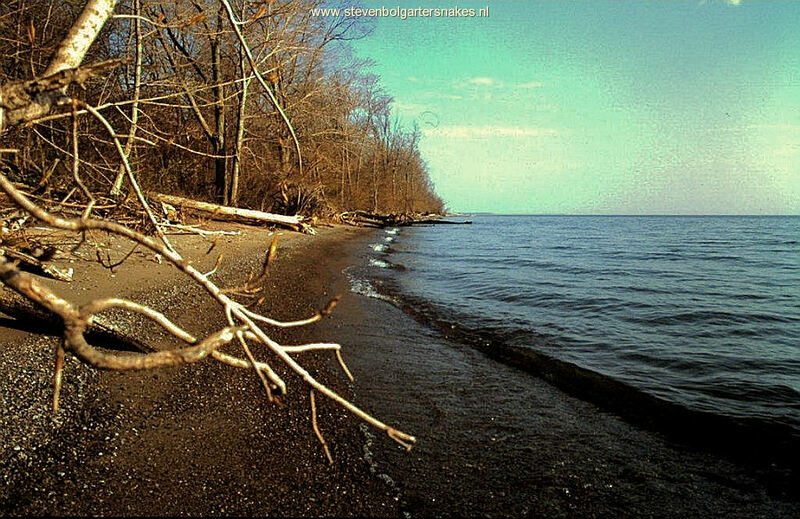 Sandy coast of Pelee Island; may 7th 2005. 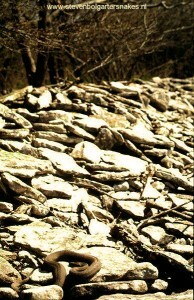 On the US islands this subspecies has become quite rare, possibly by tourism and human habitation changing its habitat. Although recent research suggest that populations are increasing again (Seymour & King, 2003). Fortunately this unique subspecies is still very abundant on the Canadian “Pelee Island” (Bol, personal observations). The islands in the Western part of lake Erie consist of limestone. 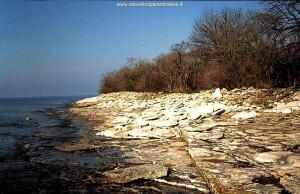 The habitat the Lake Erie Watersnake occupies is predominantly the exposed limestone and dolomite shoreline. Basking snakes and snakes hunting in the shallow, clear waters around the Island are very well camouflaged with their uniform coloration matching the colour of the rocks, whereas the usual strong banded pattern would stand out and make them very vulnerable for predation by herons and other potential predators. 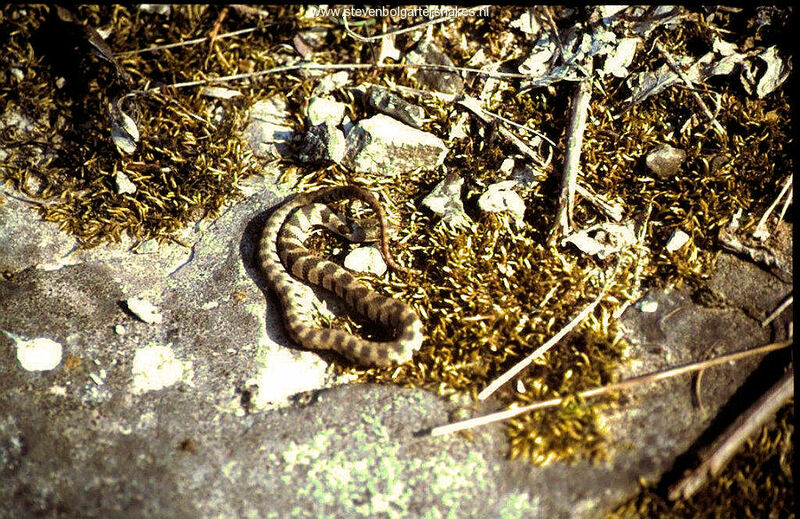 The populations of Northern Watersnakes on the mainland shores of Lake Erie all belong to the nominate subspecies (N.s.sipedon) and are strongly patterned. Every now and then one of these patterned snakes manages to make it to one of the islands and some times the snakes are seen swimming miles away from the shore in the middle of the lake. 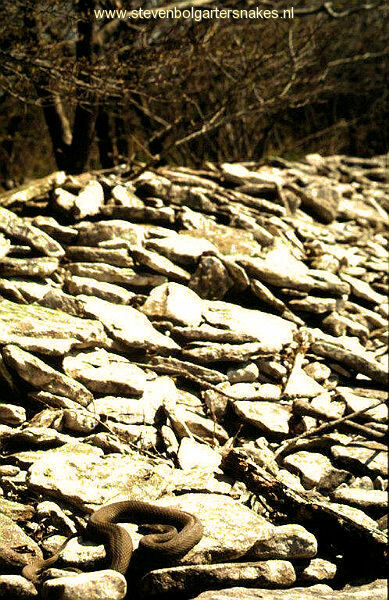 But natural selection against this pattern morph is so strong that the population on Pelee Island remains practically unpatterned and the patterned specimens do not really establish themselves. 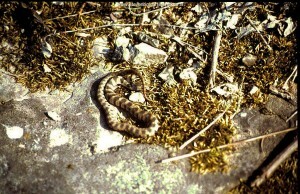 I have seen however 2 strongly patterned baby snakes (young born the previous summer) on Pelee Island in May 2005 while leaving their hibernacula. 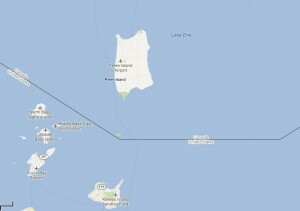 This shows that patterned specimens make it to the islands every now and then, and this is confirmed in literature. This is seen as a school example of natural selection with a mix of gene flow (Seymour & King, 2003). 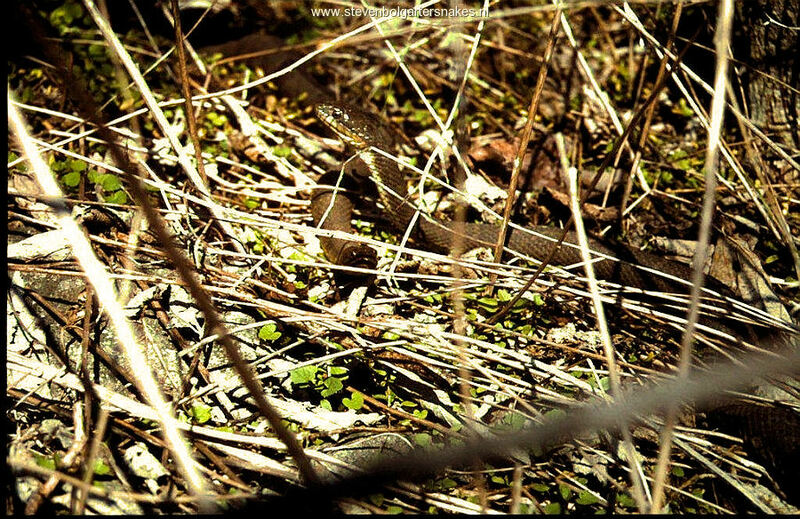 On Pelee Island in Canada N.s.insularum shares the habitat with the Eastern Garter Snake Thamnophis sirtalis sirtalis, of which considerable portion (27%) of the population is melanistic. When I visited the Island in May 2005 I found a hibernaculum where T.s.sirtalis and N.s.insularum hibernated together, at least the latter in large numbers. 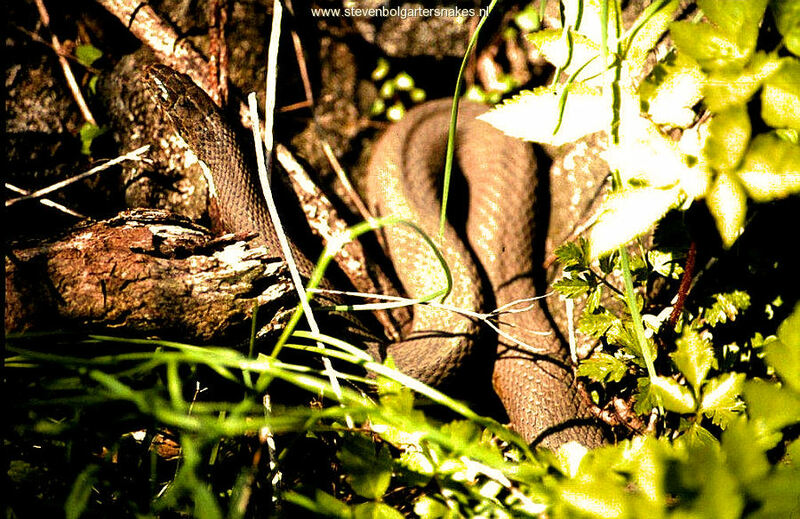 I witnessed a few adult males of the Lake Erie Watersnake leaving the hibernaculum and staying in close proximity with their heads held high, apparently checking the area for females. Some females obviously had already left the hibernaculum earlier, since I saw a large female (>100 cm TL) chasing after a frog in the high grass. Under one rock (on top/close to the hibernaculum) I found 15 neonates of N.s.sipedon born the previous summer . 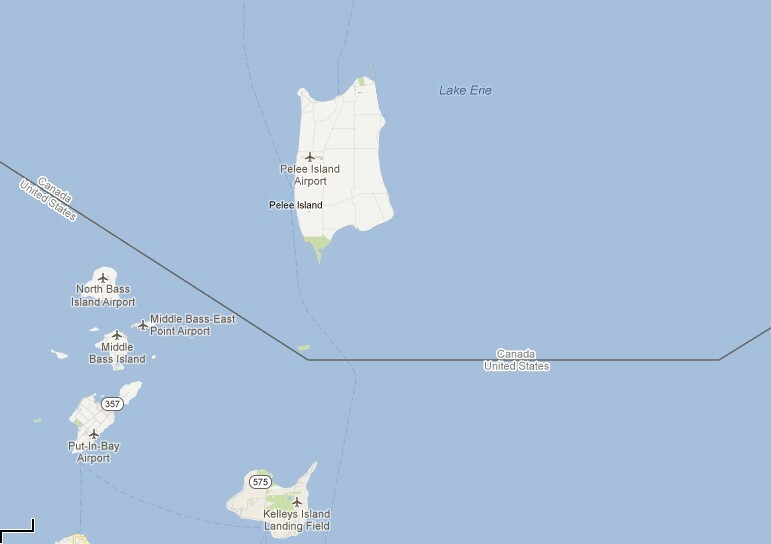 It was clear that spring had just started for both N.s.insularum and T.s.sirtalis on this island, which is in line with observations in literature (in: Seymour & King, 2003). Living on the border line between the US and Canada in Lake Erie means these snakes are used to a land climate with long winters with lots of snow and ice and warm summers. 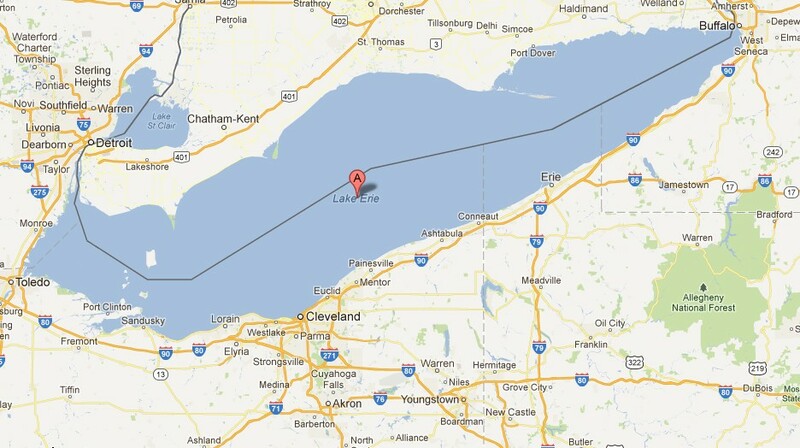 Since the islands on which N.s.insularum occurs are situated in the huge Lake Erie the water temperatures will have a big effect on the microclimate making the fall temperatures milder but it also takes longer before temperatures heat up early spring. Hibernation may last from end of September to the end of April (as long as 7 month) in the wild (in: Seymour and King, 2003). I hibernate both my adult and baby N.s.insularum at 0-7 ºC in the refrigerator; 2 months for the babies and up to 5-6 month for the adults. The guidelines for captive maintenance for T.a.atratus (Bol, 2007) also apply in general for N.s.insularum. A big difference is the long hibernation of the much more north living N.s.insularum. 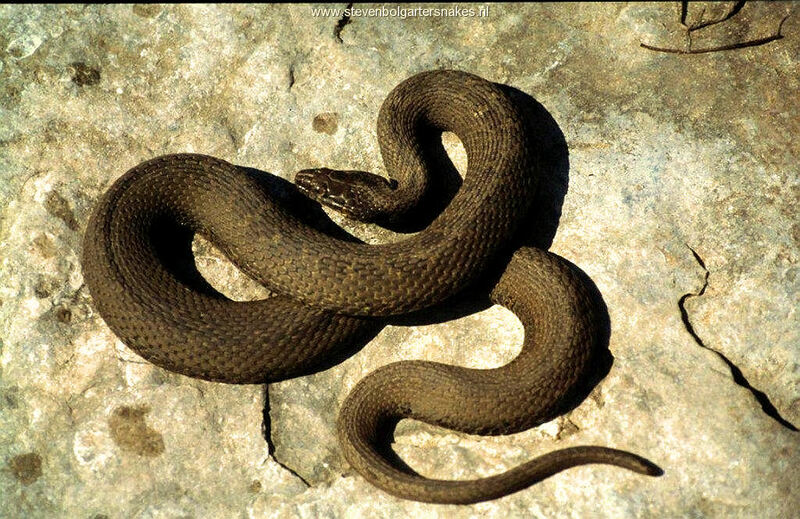 The Lake Erie Watersnake is adapted to long and harsh winters. My breeding group consists of a couple originating from the most southern tip of Ontario, Canada plus some of its offspring. My 2 adults females measure 126 and 109 cm (TL) and my adult male is 93 cm (TL).